Oasis Pure Soy Glass Candles contain 13 oz. wax poured in a heavyweight clear glass holder. They have 2 wicks and burn up to 60 hours. 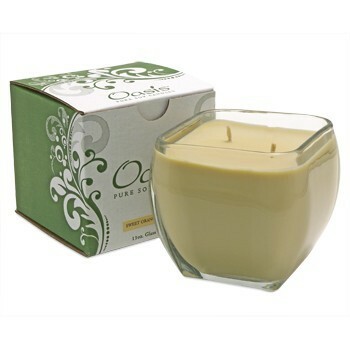 GO GREEN with Oasis Pure Soy Candles made of 100% soy wax in a smooth creamy texture and soft, subtle colors. Our highly fragranced soy wax is clean burning and uses only cotton wicks. Glass Candles, Votives, Tealights and Fragrance Chips are available in 8 unique fragrances.